In a ten-year span, from 1994 to 2004, the number of hospitals and emergency rooms decreased by 9 percent, while emergency room visits increased by more than one million visits per year, according to the American Academy of Urgent Care Medicine. A new growth spurt for the Urgent Care industry began in the mid-1990s, helping assist that emergency care demand. “As the specialty of Urgent Care Medicine grows, the public is learning that Urgent Care is a better choice over the emergency room for their immediate, non-life-threatening healthcare need,” explained Jeremy Winter, director of Beyond Urgent Care in Bethel, CT. There are approximately 9,300 walk-in, stand-alone urgent care centers in the United States, and Beyond Urgent Care is one of them. For many patients, Urgent Care centers are the main place to go for care — especially on weekends or evenings when their primary-care physicians don’t have office hours. In addition, the wait time to see a provider is typically half an hour or less at urgent cares, compared to a multi-hour wait time in many emergency departments. Among many services, Beyond Urgent Care can provide in-house X-rays, drug screens and physicals for employees, immunization, lab cultures, full lab panels, pregnancy diagnosis, hepatitis testing and more. From accidents and falls to moderate back pain, fever or flu, or minor broken bones and fractures, Beyond Urgent Care is open Monday thru Friday from 8 a.m. to 8 p.m., and on weekends from 8 a.m. thru 5 p.m.
Dr. Mathew Amara, Beyond Urgent Care’s medical director, originally started an urgent care/family care practice in South Carolina. “And that is kind of the model we have gone with up here,” explains Winter. After moving back to Ridgefield about 10 years ago, Dr. Amara practiced at Brookfield Family Medicine for seven years, and wanted to get back into the “urgent care model.” He worked for some urgent cares and decided to open Beyond Urgent Care in August of 2016. For self-pay patients, payments can be made by debit and credit cards, or cash. 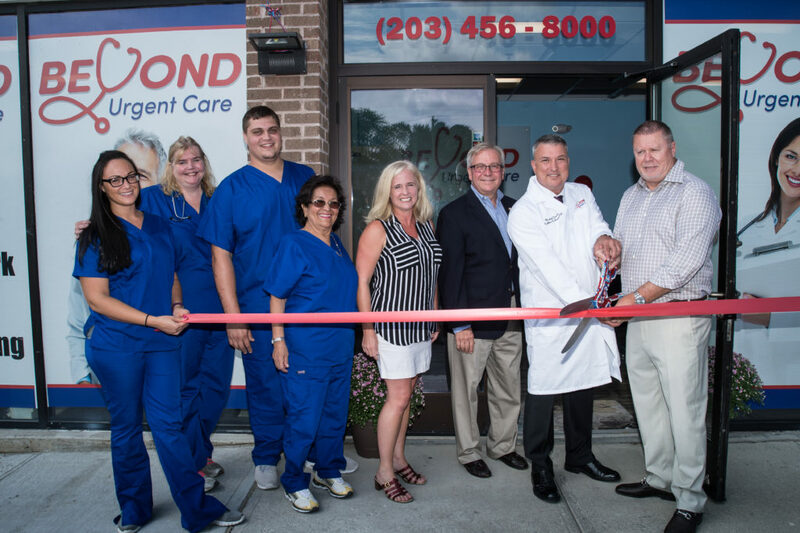 Beyond Urgent Care has three locations in Connecticut: Bethel at 6 Stony Hill Road, New Milford at 141A Danbury Road and North Haven at 79 Washington Avenue. Walk-ins welcome. No appointment needed. For more information, please visit the website at http://beyondurgentcaremed.com or call 203-456-8000.